What Can the Blue Jays Expect from Brandon Drury? Baseball America rolled out their Top 10 Toronto Blue Jays Prospects for 2018 with a few surprises. Over at Baseball America on Wednesday, the team released their 2018 Top 10 Prospects list for your Toronto Blue Jays. While No. 1 and No. 2 were predetermined in 2017’s breakouts from Vladimir Guerrero Jr. and Bo Bichette, things go a little weird after that, and that’s okay. List and rankings are a fine guide, but nothing should be treated as gospel until a player shows up and plays at the Major League level. There’s so big surprises in there, most notably the extremely optimistic ranking of 16-year old Eric Pardinho from Brazil, Ryan Borucki pushing out fringe guys like Rowdy Tellez, Sean Reid-Foley and Connor Green, and Richard Urena sticking around despite a mediocre 2017 and limited and flawed debut. Other notable missions include T.J. Zeuch and Jon Harris. * I'm unsurprised about Pardinho's inclusion and high ranking. Ben knows his international prospects. * I'm glad Danny Jansen is ranked highly. He's a near-MLB-ready catcher. He should be high. * On the flip side, Logan Warmoth is officially under the radar. As always, but especially with this impossibly slow offseason, there was some good conversation on the prospects list. Jesse Goldberg-Strassler dropped the thoughts above, and plenty more flooded in afterwards. Despite some fan favorites slipping in the ranking, the general consensus was that there’s plenty to be excited about with this team’s future. BA’s top prospect guy Ben Badler hosted a chat in the afternoon to give a little extra depth into the rankings with some deeper analysis. 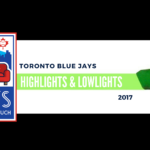 Below are some highlights to whet the starving mouths of Blue Jays fans who have had nothing to get excited about yet this offseason. Some of these have been shortened for this post, indicated by an “*” for redaction. You can read it all here in much better detail than I can provide. Do it. And go buy a BA subscription if you can. > Will Vlad jr stick at Third base if not what will his eventual position be ? BB: I think he has the ability to stay there. With him it’s different than Bo, because Vladdy is already grown taller and he’s about 6-2, 6-3, 235 pounds now and he’s only 18 years old. As players get older, they don’t tend to get smaller, so with him, body type and what it means for his future mobility is the main risk for him staying at third base. * At some point, I think he will find his way to either a corner OF spot or first base, but if he hits like I expect him to, he’s still a potential superstar wherever he plays. > Vlad’s 80 Hit and 70 Power tools have somewhat surprised me mainly because I have never seen an 80 Hit nor one combined with a 70 Power. For historical references who are some former prospects that have had those type of tools before? BB: It’s aggressive, but he’s clearly a special talent and those top five prospects in baseball are the ones you should be aggressive with because their track record is so good. It’s where you find players like Harper, Trout, Stanton, Mauer, Teixiera, Chipper Jones and back in the day Vlad Sr. ranked. There’s risk—Delmon Young, Jesus Montero, etc. were all in that top five overall prospect list group once—but Vladdy Jr has such a special combination of hitting, patience and power and has so many scouts convicted in his offensive ability that his career could easily end up in the echelon of that first group of superstars. Johnny (Alabama): Does Vlad Jr. force the Blue Jays’ hand and get called up by mid-2019? Ben Badler: I think he’s going to be so good in 2018 that you’re going to hear clamoring for him to be up by the end of this upcoming season. But unless the Blue Jays are pushing for a playoff spot, I think very early 2019 is more likely. > What will Bo Bichette’s long term position be? BB: I think he has a chance to play shortstop. Some of it may depend on who else is in the organization, where if you add another shortstop who’s clearly a plus defender, that makes it more likely to move Bichette to second or third. * If Bichette does go to 2B or 3B, his bat still gives him star potential (and his defense would be potentially above-average at those spots), but I see a player who has the ingredients to stay at shortstop for now with a chance to play there in the big leagues. BB: Bichette for me is one of the top five prospects in baseball. I’m probably the high man on Bichette on the BA staff, for what that’s worth, but he’s the type of player the Blue Jays should be building around, not trading away. I think their front office is on that same page. >From an offensive profile how does Bo Bichette stack up to other middle infield talents like Tatis, Rodgers, Adames, Torres, Hiura, Lewis, Gordon, etc. Are we talking about an elite bat and just quibbling/speculating over the future position on the diamond? BB: I’d take Bichette’s hit and power combo over any of those players. Gleyber and Willy Adames have less risk because they’re basically MLB ready right now and some of the other players have louder tools outside the batter’s box, but Bichette’s offensive ability is top notch. > Is Reid-Foley’s future likely to be in the pen, in your estimation? BB: I think bullpen is the most likely option. I know a lot of scouts who think so too. That said, I would keep developing him as a starter and see if it clicks, because the stuff is still there. It’s a power fastball and the secondaries work, but it just depends on the night whether his curveball, slider or changeup are going to be on that outing or if they’re going to flatten out on him. Having consistency throughout the season with his secondary pitches and of course improving his fastball command are going to be key for him next year. > Is Conner Greene likely to shift to the pen if his walk rate doesn’t improve? BB: I think so, although like I said with Reid-Foley, I would keep developing him as a starter for now. He’s an excellent athlete with a fastball that can hit 101 mph, but there isn’t a lot of movement or deception so hitters still square that fastball up better than the pure velocity would normally suggest. There’s a lot of work to do with his command and improvement of the secondary stuff too. I also remember when Dellin Betances was a 24-year-old starter in Triple-A who was getting shelled and walked almost a batter per inning, then moved to the bullpen and the light bulb went on. I’m not predicting that same transformation for Greene, but I do think there’s a chance things could click for him in a relief role. > Are you able to explain ranking Eric Pardinho so high when he’s only 16 years old and has yet to play professional baseball? Is the Blue Jays system that top heavy, or do you project Pardinho that highly? BB: A little bit of both. I do think the Blue Jays system drops off pretty quickly after the top handful of prospects, but Pardinho is exciting. I think that’s pretty evident from our updated scouting report on his stuff and the delivery/pitchability from a 16-year-old. * There’s a ton that can go sideways with 16-year-old arms, but the combination of upside and relative polish for his age is pretty exciting. > Where did Zeuch rank? What’s his upside? BB: He was just off the Top 10, and really in that same tier as the players at the back of the top 10 with different risk profiles but not a lot of overall separation between them. He’s a strike-thrower with a big fastball from a steep downhill angle with heavy sink, so it’s hard for hitters to lift the ball in the air against him. The injuries were a setback this year for him, and long term, he’s going to have to come up with a better secondary pitch because he doesn’t miss many bats. I think it’s a chance for a back-end starter. While we’ve had virtually nothing to talk about this offseason aside from the Blue Jays’ rivals getting stronger and hypothetical trades of the team’s best player, Wednesday’s break from the dullness was very much welcomed. With Bichette and Guerrero Jr. at the upper reaches of the farm, the possibility of a quick turnaround from 2017’s awfulness is, well, plausible. That being said, they’re all still prospects, and anything can happen. Should the 2018 Blue Jays makes some offseason moves and shake off the mediocrity of 2017, one or more of these prospects in the list may be shipped off in order for the current roster to make one last playoff run with (an unextended) Josh Donaldson. Even more likely is the possibility that some of these guys just don’t make it at the MLB level. Let us know your thoughts, concerns and expectations in the comment section below! HEAD ON OVER TO THE JAYS FROM THE COUCH VS ALS STORE AND GET SOME GREAT SWAG THAT YOU WILL LOOK GREAT IN AND YOU CAN FEEL GREAT ABOUT. 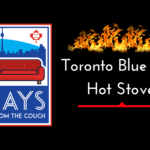 YOU CAN ALSO HEAD TO OUR JAYS FROM THE COUCH VS ALS FUNDRAISING PAGE TO MAKE A TAX DEDUCTIBLE DONATION DIRECTLY TO ALS CANADA. THANK YOU FOR VISITING JAYS FROM THE COUCH! CHECK US OUT ON TWITTER @JAYSFROMCOUCH AND INSTAGRAM. LIKE US FACEBOOK. BE SURE TO CATCH THE LATEST FROM JAYS FROM THE COUCH RADIO AND SUBSCRIBE TO OUR YOUTUBE CHANNEL! Roy’s earliest memories all involve baseball from the early 90’s and the Blue Jays dream teams. He became a Blue Jays fan while watching Carlos Delgado and Shawn Green evolve in Syracuse, NY at the run-down confines of MacArthur Stadium, nestled between highway and swamp. A lifelong baseball player, Roy still plays (P, C, 2B, 3B) in the 25+ Syracuse MSBL for the Liverpool Mets. He watches almost all games with his best buddy Sebastian, a five year old Pug, who could care less. Are the Toronto Blue Jays Really This Good? Follow Jays From the Couch! Jays From the Couch is an independent news outlet covering the Toronto Blue Jays. JFtC is in no way affiliated with the Toronto Blue Jays or Major League Baseball.